The Full Moon is Tuesday February 23. Jupiter is visible in the late evening sky. 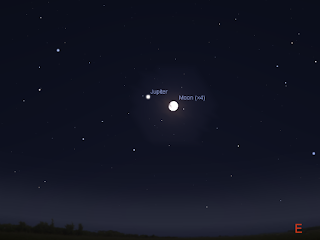 The Moon is close to Jupiter on the 24th. All five bright planets; Jupiter, Mars, Venus, Saturn and Mercury form a long line in the morning sky. Venus and Mercury are close low above the horizon. Saturn is close to the red star Antares. The Full Moon is Tuesday February 23. Evening sky on Wednesday February 24 looking east as seen from Adelaide at 23:00 ACDST. The Moon is near Jupiter. Similar views will be seen elsewhere in Australia at the equivalent local time. (click to embiggen). Jupiter enters the evening sky around 21:00 daylight saving time, but is only really good for telescopic observation from around 23:00 on. Jupiter's Moons will be an excellent sight late in the evening. There will be some good line-ups this week, especially the 18th, 22nd and 24th. The evening is also graced by the summer constellations of Taurus (with the V shaped cluster the Hyades forming the head of Taurus the Bull and the beautiful Pleiades cluster nearby) Orion the Hunter and Canis Major with bright Sirius, the dog star, above the northern horizon at the beginning of evening. Early morning sky on Saturday February 21 looking east as seen from Adelaide at 5:30 ACDST showing Mars, Saturn with the red star Antares close by, Venus and Mercury. Similar views will be seen elsewhere in Australia at the equivalent local time. (click to embiggen). Jupiter is lowering in the north-eastern morning skies and is rising around 21:00. 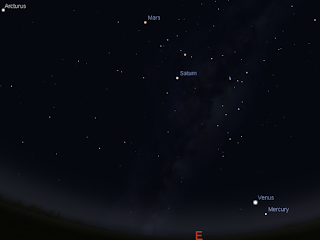 Mars is higher in the morning skies and is readily visible in the pre twilight dark. Mars slowly heads towards the head of the Scorpion..
Venus is easy to see in the morning twilight. It is a distinct "gibbous Moon" shape and is nice in a small telescope. Venus is now within less than a hand-span of Mercury, and the pair remain close for the next couple of weeks. Saturn climbs higher in the morning sky. Mercury is low in the morning twilight. Mercury and Venus are within less than a hand-span of each other, and the pair remain close for the next couple of weeks. This week all five of the bright planets are visible in the morning sky. Saturn and the red star Antares are close. During the week Venus moves through Capricornius. Mercury is close to Venus.